Not really. But if you need to convince your wife that this is a family kayak, go for it. The Vubu is obviously not designed for real flatwater paddling, but it is not too horrible to paddle on the flatwater sections between rapids. For multi-day whitewater trips where there are lots of rapids and not too many miles of flatwater, the Vubu is a great kayak. 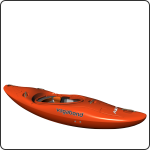 It is super easy to pack your stuff in the stern of the kayak, with no pillar to obstruct your access. It is also easy to take out the footrest because there is no front pillar, so you can load a few items in the bow of the kayak too. 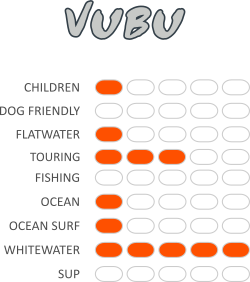 If you only have one kayak and desperate to get on the ocean, you can play around on the sea with the Vubu. The same properties that make it handle whitewater well, will make it easy to paddle through surf break. But, it is not a surf kayak and it’s not good for long distances on the ocean. Yeah. That is what this boat is designed for. The bigger and more technical, the better. It will make easy rapids boring, and bring difficult rapids closer to your comfort zone.